Using 3-D electron microscopy, structural biologists from the University of Zurich succeeded in elucidating the architecture of the lamina of the cell nucleus at molecular resolution for the first time. This scaffold stabilizes the cell nucleus in higher eukaryotes and is involved in organizing, activating and duplicating the genetic material. Diseases such as muscular dystrophy and premature aging, caused by mutations in the lamin gene, the major constituent of the lamina, can now be studied more effectively. Compared to bacteria, in eukaryotes the genetic material is located in the cell nucleus. Its outer shell consists of the nuclear membrane with numerous nuclear pores. Molecules are transported into or out of the cell nucleus via these pores. Beneath the membrane lies the nuclear lamina, a threadlike meshwork merely a few millionths of a millimeter thick. This stabilizes the cell nucleus and protects the DNA underneath from external influences. Moreover, the lamina plays a key role in essential processes in the cell nucleus - such as the organization of the chromosomes, gene activity and the duplication of genetic material before cell division. Now, for the first time, a team of researchers headed by cell biology professor Ohad Medalia from the Department of Biochemistry at UZH has succeeded in elucidating the molecular architecture of the nuclear lamina in mammalian cells in detail. The scientists studied fibroblast cells of mice using cryo-electron tomography. "This technique combines electron microscopy and tomography, and enables cell structures to be displayed in 3D in a quasi-natural state," explains Yagmur Turgay, the first author of the study. The cells are shock-frozen in liquid ethane at minus 190 degrees without being pretreated with harmful chemicals, thereby preserving the cell structures in their original state. "The lamin meshwork is a layer that's around 14 nanometers thick, located directly beneath the pore complexes of the nuclear membrane and consists of regions that are packed more or less densely," says Yagmur Turgay, describing the architecture of the nucleoskeleton. The scaffold is made of thin, threadlike structures that differ in length - the lamin filaments. 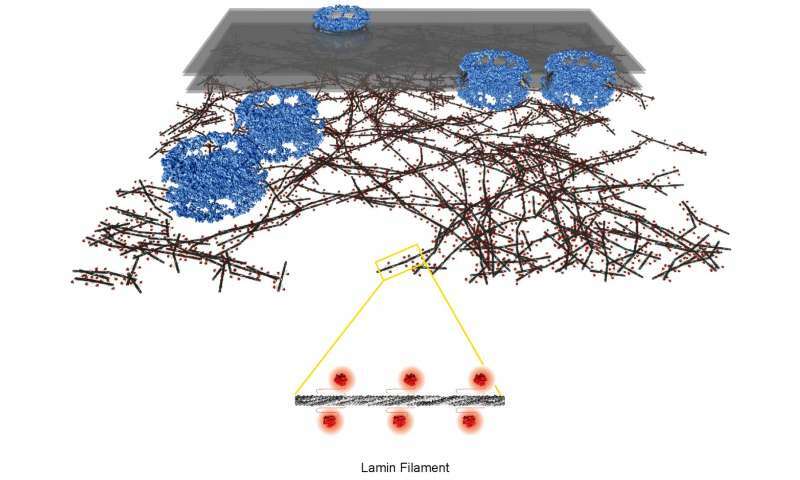 Only 3.5 nanometers thick, the lamin filaments are much thinner and more delicate than the structures forming the cytoskeleton outside the cell nucleus in higher organisms. The building blocks of the filaments are two proteins - type A and B lamin proteins - which assemble into polymers. They consist of a long stem and a globular domain, much like a pin with a head. Individual mutations in the lamin gene elicit severe diseases with symptoms such as premature aging (progeria), muscle wasting (muscular dystrophy), lipodystrophy and damage of the nervous system (neuropathies). "Cryo-electron tomography will enable us to study the structural differences in the nuclear lamina in healthy people and in patients with mutations in the lamin gene in detail in the future," concludes Ohad Medalia. According to the structural biologist, this method permits the development of new disease models at molecular level, which paves the way for new therapeutic interventions.